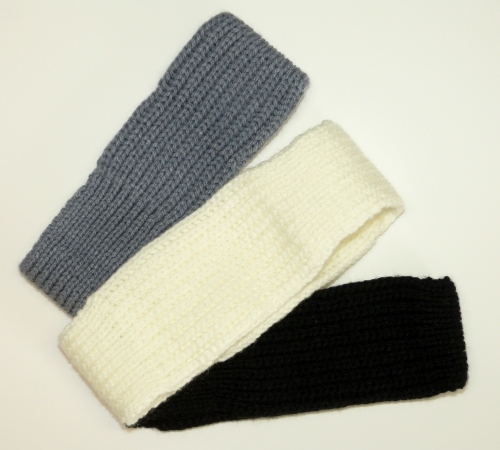 Ribbed knitted ear warmers are very stretchy and adjustable, but they are also available in 3 sizes. There are slightly wider, extra cushy sections to fit over the ears and keep them nice and cozy. But the minimalist size has very little impact on your hairstyle. These ear warmers are great for guys who don't like to wear hats, but also don't like bright red ears! These are lightweight and easy to carry; just fold up and stick into a pocket or purse. I usually make the ear warmers in acrylic so they can be machine washed and dried. But if you prefer extra warmth, I’m happy to use wool instead. These can be knitted in many different colors, so you can match your favorite school or team gear! Since they're easy to store, you can have a different knitted ear warmer to match each of your jackets or coats.